Tuesday morning’s hearing of the Joint Economic Committee highlighted the continuing challenge of long-term unemployment, which remains a persistent and pernicious problem nearly four years after the economic recovery began. Last month, 4.6 million Americans had been unemployed for more than six months. Many of them have experienced devastating financial losses, and their job prospects remain grim. No one, not even the distinguished witnesses at Tuesday’s hearing, has been able to find the magic bullet to get them back to work. Between August 2008 and December 2011, 6 percent of workers age 25 or older were unemployed for at least six consecutive months. Half of them experienced income declines of 40 percent or more, and more than a quarter fell into poverty. Long-term unemployment reduced incomes most for African Americans, unmarried workers, men, and college graduates. High school dropouts, African Americans, unmarried workers, and adults age 25 to 34 were most likely to fall into poverty when out of work for six months or more. The financial toll would have been even worse without the social safety net and help from spouses. Half of the long-term unemployed collected unemployment insurance benefits, which for the typical recipient replaced 43 percent of lost earnings. Spousal earnings also cushioned the financial effects of job loss for many married workers, a form of insurance that wasn’t available to unmarried workers. However, critical gaps in the safety net are obvious. Half of unemployed workers did not collect any unemployment insurance benefits six months after losing their jobs, primarily because they didn’t earn enough or work long enough to qualify. Coverage rates were lowest for African Americans, workers who did not complete high school, and those younger than 35, groups whose precarious finances even while working make them especially vulnerable during bad times. For most of the long-term unemployed, other income sources didn’t change much six months after they lost their jobs. Few got financial help from family or friends in those first six months or tapped their retirement savings, and few spouses of the unemployed began working more. Few began receiving Supplemental Nutrition Assistance Program benefits (still known to many as food stamps), disability benefits, or other types of government assistance. Most unemployed workers age 62 or older, however, did begin collecting retirement benefits. Social Security was a vital lifeline for out-of-work seniors, but collecting Social Security early has permanent consequences because it lowers their monthly benefits for the rest of their lives. This can create financial hardship near the end of life when health care costs typically soar. 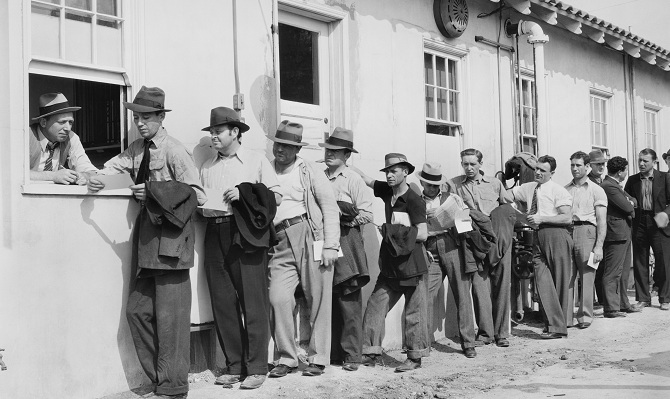 How can we get the long-term unemployed back to work? No one really knows. The obvious solution is to kick start the economy and spur job creation, but there’s no elixir for slow economic growth. People talk about more education and training, but it’s not clear how much that really helps. Perhaps the best advice at yesterday’s hearing came from AEI’s Kevin Hassett, who recommended a series of employment experiments across the country to test what works and what doesn’t. At the very least, it would help researchers find jobs.